There is "a gradual shift" to riskier borrowers in Canada. If the term “subprime” means anything to you, it likely conjures up images of the U.S. debt crisis of 2008-09, when subprime borrowers, unable to pay their loans, helped push the financial system to the brink of collapse. So it probably isn’t good news to hear that subprime lending is becoming a bigger part of Canada's economy. According to new data from credit information company TransUnion, subprime lending — meaning lending to the riskiest borrowers — is becoming an ever-larger part of the credit business in Canada. Subprime borrowers typically pay higher interest rates on their loans than others. The average amount owed on Canadian credit cards rose by 1.8 per cent over the past year, but among subprime borrowers, it rose at more than triple that rate, up 5.7 per cent in a year, TransUnion said. Among less-risky “prime,” “prime plus” or “super prime” borrowers, credit card balances have been declining, by 1.5 to 4.7 per cent over the past year. “Average balances haven’t moved much, if you consider all Canadians together,” TransUnion director of research and analysis Jason Wang said in a statement. The average Canadian’s non-mortgage debt rose by 2.7 per cent over the last year, to an average of $21,348, TransUnion says. The TransUnion study looked only at non-mortgage debt, but a similar trend is emerging with mortgage debt as well. The share of Canadian mortgage-holders with extremely high debt levels (above 500 per cent of disposable income) jumped to 11 per cent by 2012, from 3 per cent in 1999. Debt delinquencies are also on the rise. The share of indebted consumers who failed to make a debt payment for 90 days rose by nearly 3 per cent over the past year. But there are large regional differences. Delinquencies shot up by nearly 12 per cent in Alberta over the past year, part of the fallout of the oil price collapse. “We continue to see material delinquency increases in the oil provinces, and we suspect that it will continue over the next few quarters,” Wang said. 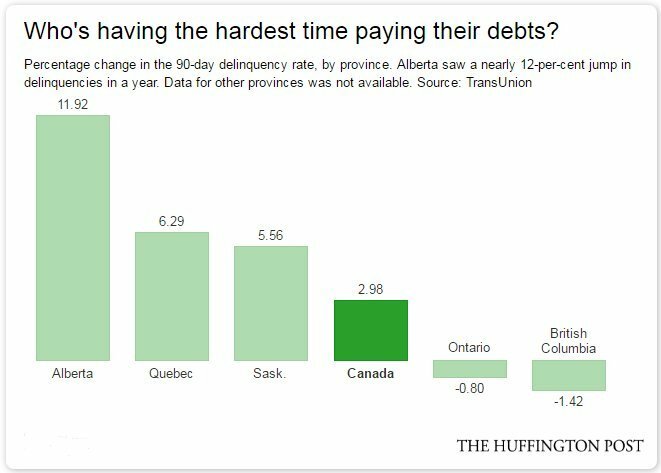 Delinquencies fell slightly in two provinces: Ontario and British Columbia. These provinces are also creating most of the jobs in Canada and its principal cities are leading house price growth. And despite the growth in subprime lending, Wang says Canada has a “generally healthy and well-functioning consumer credit marketplace,” at least outside oil-exporting regions. While banks are understandably worried about borrowers in the oil patch, “the robustness of consumer spending and credit performance outside the oil provinces shouldn’t be ignored,” Wang said.